See images from Bongard’s computer simulation. Watch a video of how the robots adapt to new terrain. Watch a video of how Bongard builds resilient robots. Josh Bongard's robot walks with a limp. But it's impressive that it walks at all. As a postdoc at Cornell, Bongard collaborated with roboticist Hod Lipson and PhD student Victor Zykov to develop a robot that can adapt to changes in its body or in the environment--a key advance for robots designed to work outside a controlled laboratory setting. 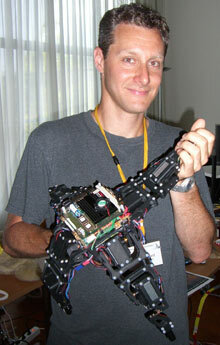 ­Bongard, now an assistant professor of computer science, begins by programming his robot with basic information about its design, such as the mass and shape of each of its parts. In his standard demonstration, he then disconnects one of its four legs. To get a sense of its handicap, the robot rocks back and forth, activating two tilt sensors. It then builds a virtual model of itself, using simulation software, and uses that model to test new ways of walking despite its handicap. Once the robot has developed a successful simulation, it attempts to walk using the same technique. Rodney Brooks, professor of robotics at MIT, says that Bongard's work is interesting because it's inspired by the way biological systems adapt. To meet roboticists' future goals of creating self-configuring robots, Brooks says, "these sorts of ideas are going to be essential."